A podcast exploring the cultures, communities, and contexts of scientific progress. In the 16th century, great advances were made in anatomy. Amazingly, this didn’t lead to a single improvement in surgery, which remained crude, cruel, and lethal. Prefer to read along? Click here to view the transcript! Are you as intrigued by the skeleton in this show’s logo as I am? Probably not. It does have its place in the history of science, though. It’s a five hundred years old drawing that comes out of the first modern anatomy book ever written. It has had people mesmerized by it ever since. Nowadays, the writer of the book, the Fleming Andreas Vesalius, is hailed as a revolutionary proto-scientist and the founder of modern anatomy. And while those claims are not exaggerated, there is one thing Vesalius’ book did not have any impact on: medical practice. His exquisitely detailed drawings of the human body did not shed doubt on the ancient practice of bloodletting, nor did they stop anyone from trepanning skulls as a treatment for insanity. They didn’t even improve amputations, Cesarean sections, or any other type of common surgery. 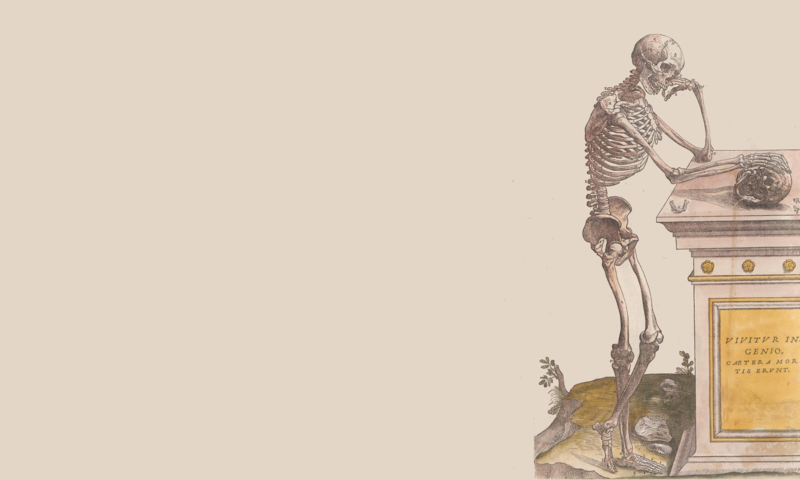 Hello and welcome to A History of Science: Episode 4: Between Skin and Bones. The Scientific Revolution saw an unprecedented increase in knowledge in a wide range of subjects, from physics to astronomy to biology. By 1650, anatomists had dissected our bodies and learned the purpose of most of its organs; physicians had fiercely debated William Harvey’s theory of blood circulation – and relented to his evidence; physicists had viewed the makeup of our tissue through their microscopes, and had seen the tiny organisms that lived on it with their own eyes. All was in place for a medical revolution. But nothing happened. For centuries to come, the constantly increasing understanding of nature and anatomy did not change medical practice one bit. Until the late nineteenth century, doctors still relied on Hippocrates for their diagnoses and their cures. Why? Now that’s a complex question to answer. One that can be approached from many different angles, involving an array of interesting characters and events. It is a question worth coming back to time and again, and we certainly will. In this episode, we will explore this question from the perspective of surgery: why didn’t it change with advances in anatomy? And why was real progress – when it happened – so slow to spread? Especially, we will dive into the stories of two pioneers who made important discoveries in the very same decade, yet who never met: Andreas Vesalius and Ambroise Paré. In 1538, Andreas Vesalius stole a corpse. In the dead of night, he sneaked to the field of gallows in his hometown of Brussels. There, the tortured corpses of executed criminals were left to rot in gibbets, until nature devoured them. Vesalius cut down one of the unfortunate men’s corpses, cut it into smaller chunks, and took it home. There, he boiled the limbs one by one, until the flesh fell off and only the blackened bones remained. He then set himself to the task of painstakingly reassembling the body, bone by bone. When he was done, he had created the first anatomical skeleton since antiquity. It would make him world famous – and unpopular with his neighbors, no doubt. Vesalius had to operate in secrecy, as the dissection of corpses was outlawed virtually everywhere in Europe. Killing someone was one thing, but depriving him of his body on Resurrection Day was a step too far in Christian Europe. Because of that, the last dissections had been performed in pre-Christian Greece. In the fourth century BC, Herophilus and Erasistratus had dissected the bodies of condemned criminals. Their texts had been lost, and what remained of their knowledge was Galen’s account of their work. That account, combined with the knowledge he had gained from animal dissections, formed the basis of medieval anatomy. And it was deeply flawed. When Vesalius published his book De humani corporis fabrica, or On the Fabric of the Human Body, he took full advantage of the technology of his time. Thanks to the printing press, it was richly illustrated with deeply detailed depictions of the human body. Bones, muscles, and organs were not only well described, but were clearly visible. Gone were the sketchy illustrations in Galen’s reprints. Almost immediately, Vesalius’ book had a great impact; he corrected countless mistakes in the antique texts, and had the evidence to prove his claims. He singlehandedly sparked the study of anatomy which would become a mainstay of medical teaching up until now. Andreas Vesalius is often regarded as a scientific revolutionary before his time, marking the beginning of the movement that would steadily disfavor the writers of antiquity and replace their dogmas with rational science. Unfortunately, however, his work did nothing to dethrone Galen and Hippocrates. The world was not ready to fully embrace the new science and throw out the old. And Vesalius was not out to dethrone anyone. Remarkably, Vesalius did not see himself as the revolutionary he is usually portrayed as. We know he invented something – medical anatomy – that may have never been invented before. We know virtually nothing of the extent of Herophilus’ and Erasistratus’ work, and we do know that Galen only dissected animals, not people. That makes Vesalius a pioneer if ever there was one. Andreas Vesalius was not modest: he proudly includes a picture of himself in his famous book. But he did not think he was discovering anything the ancients hadn’t known. He was convinced – as many of his contemporaries were – that Galen had dissected human cadavers himself. Any errors in his writing, then, must be due to the manual process of copying books for fifteen hundred years. Vesalius placed himself in the long tradition of rediscovering knowledge the ancients had had; he was not out to prove them wrong. So as far as scholarship went, Vesalius’ contemporaries saw him as picking up where Galen had left off. There was no sudden realization of Hippocrates’ shortcomings, nor an unshakeable belief in experimental methods. It would be a very gradual process that – bit by bit – replaced the ancients’ doctrines over the course of centuries. So the scientific establishment did not radically change with Vesalius’ discoveries. But how about medical practice? Shouldn’t surgery, for example, benefit greatly from this new anatomical knowledge? Or, at the very least, from the exquisitely detailed drawings in his book? Surprisingly, no. There are no records indicating that surgery became any better, safer, or more common after Vesalius’ publication. To understand this lack of practical impact, we have to look at where surgery fit in medieval society. It was a last resort, for starters. In a time before anaesthetics, surgery was extremely crude and traumatizing. Patients were dragged in, held down on the operating table, and mercilessly sawn into. If they didn’t die from shock or blood loss, infection was a likely third option. Obviously, surgery took a high toll on everyone involved; not just the patient, but the surgeon as well. And because medieval surgery resembled a butcher shop more than an operating theatre, it was considered beneath the status of learned men. Physicians with medical degrees would never perform manual labor of any kind, so why should surgery be an exception? Surgical operations were left to so-called barber surgeons: barbers who already had knives for shaving and cutting hair, and who might as well use them for the odd amputation. Barbers, of course, did not have an academic education, nor did they speak Latin. The revelations in Vesalius’ work, then, were not accessible to them and saw no application on the operating table. One of the barber surgeons for whom the discoveries of Vesalius remained inaccessible was the Frenchman Ambroise Paré. Paré was practising in Paris, when in 1537 he was sent to serve in the French army as a battlefield surgeon. Now, as a barber surgeon he can’t have been squeamish; he must have performed countless bloodlettings and occasional amputations during his time in Paris. But what he saw on the battlefield positively abhorred him. Gunpowder-flung projectiles maimed soldiers in horrible ways, leading to their comrades often putting them out of their misery rather than subjecting them to even more cruelty by the hands of Paré and his colleagues. Now, the only respite surgeons could give their patients was speed. The common practice for amputation was to take off the limb as quickly as possible, then make sure the bleeding stopped before the patient bled to death. In the 1500s, cauterization was the preferred method of stopping the bleeding after amputations. That meant that either red-hot irons were pressed against the veins, or boiling oil was poured into the wound. Paré realized that his patients were as likely to die from the shock of cauterization as they were from the wound infecting afterwards. He started looking for an alternative. He found it in ligatures. Ligatures are short pieces of thread that are tied around blood vessels. Paré found that tying silk around veins is effective in stopping the blood flow, saving the patient from dying due to blood loss, not to mention from the immense pain of cauterization. Paré wrote about his discovery in his 1534 treatise on gunshot wounds. Like Vesalius, Paré used many detailed illustrations to embellish his writing. Unlike Vesalius, though, the book was meant as a guideline for other barber surgeons working in similar conditions, not as a scholarly work. It was written in the vernacular rather than in Latin, and was never referenced in academic circles. Paré himself, actually, was only recognized as a surgical pioneer in the twentieth century, but had been mostly forgotten in the centuries before. Paré’s work, however, would have solved a prudent theoretical dispute, had any scholar bothered to read it. In the 1500s, the way blood flows through the body was badly understood. Owing all the way back to Galen, even the distinction between veins and arteries was in dispute. It was commonly held that arteries, unlike veins, contained air rather than blood. Experience with dead animals showed that arteries were mostly empty, save for a couple of drops of blood. Now, this is actually due to the fact that without the heart actively pumping blood through the body, liquids in the arteries drain away. It wouldn’t be until academics accepted Vesalius’ work, and that of William Harvey’s on blood circulation half a century later, that this theory was finally discarded. Ambroise Paré, who had lots of experience tying ligatures around both veins and arteries, could have easily confirmed that both of them were indeed blood vessels. To us it may seem unfathomable how something as mundane as a lack of communication was the main cause for centuries-long surgical stagnation. The absence of any discourse between practitioners and scholars was not just caused by their differences in status, however. It reveals a very different relation between theory and practice that permeates all fields of proto-science. A relation that both Vesalius and Paré were pioneers in shattering. In medieval Europe, theory dictated science. Practice served merely as a demonstration of theory. So while we’re on the topic of anatomy, imagine this scenario: one of the few places where human dissections were allowed before the work of Vesalius, was Padua, in Italy. There, students were taught anatomy while a corpse was being dissected before their very eyes. Their professor would recite Galen’s work on anatomy while a barber surgeon cut open the body and showed the appropriate organs to the students. That meant that everyone in the room could see with their own eyes how, for example, the lower jaw exists of a single bone – not two, as Galen claimed – or how the liver has only two lobes – not five, as Galen claimed, or how the heart’s two chambers are not connected – and thus have no holes, as Galen claimed. Everyone could see that the body did not conform with Galen’s descriptions. So did anyone point out his errors? No, they all agreed the body was flawed. With our mindset it is all but impossible to follow such a line of reasoning. But medieval science was deeply influenced by the ancient Greeks, who were obsessed with purity. After Socrates, all visible objects were held to be imitations of their perfect original forms. That is why planets, for example, had to follow perfectly circular orbits, or at the very least tended towards a perfect shape. This idea blended nicely with the Christian vision of a perfectly created, but corrupted, world. God had not created a natural chaos. There was a perfectly created original man to whom every living person naturally tended. And so the students would agree that the person whose corpse was being dissected was just very far removed from perfection. He must be deformed due to his flawed character and his sinful behavior. The extent to which people approached Creation’s perfection was simply reflected in their bodies. And since most dissections were performed on executed criminals, it was easy to attribute their ‘deformities’ to the impurity of their natures. Even though Vesalius’ and Paré’s immediate influence on surgical practice was limited, they were pioneers in redefining this relationship between theory and practice in medicine. They both were convinced, well before their time, that practical experiment should be the leading feature in science. After his first grave robbery, Andreas Vesalius would dissect many other bodies, often publicly. Before the eyes of mesmerized onlookers, he would make grand shows of his handiwork, laying bare the threads of Creation itself. He actively encouraged his colleagues and critics to repeat his experiments, and see for themselves how he had reached his conclusions. He argued by example, not by authority. Ambroise Paré went even further than that. During a military campaign in 1537, he invented the clinical trial, by accident. While cauterizing wounds, Paré ran out oil. In a desperate attempt to help his patients, he turned to an old recipe he had heard about before: a tincture of egg yolks, rose oil, and turpentine. To his amazement, he found that the wounds of the patients treated with this tincture healed much better than those treated with the conventional burning oil. Even though he did not understand why – it worked because of the antiseptic properties of his tincture – he kept using it. More importantly, he started applying this comparative approach to his patients more and more often. In one case, in which a soldier’s face was burned from gunpowder, he allegedly applied conventional burning paste to the man’s left cheek, and an alternative tincture of rosebud oil to his other. Paré’s unconventional interest in medical experiments was not followed up on, however. Even though he published his methods and results, the practice died with him. His approach of experiment over understanding would be essential to the success of the medical revolution. When it finally happened, four centuries after Vesalius and Paré, evidence of successful treatments often came before theoretical understanding. Perhaps unsurprisingly, progress was starting to be made after the practice of surgery and the study of medicine blended together. Around the turn of the nineteenth century, the profession of barber surgeon was disappearing, being replaced by that of the academically trained surgeon. In England, the Royal College of Surgeons required its members to have medical degrees from 1800 onwards. Four decades later, anesthetics were discovered and quickly embraced by the surgical community. In the fifty years following that, advances in germ theory, antiseptics, and the rediscovery of the clinical trial made surgery painless, effective, and relatively safe. Make no mistake: both Vesalius and Paré were extremely influential. Vesalius’ work formed the basis for modern anatomy, while Paré’s contributions made medical knowledge accessible to practitioners outside academia. They could have achieved so much more, however, had they joined forces. Before that could even be imagined, though, the relations between scholars and practitioners, authority and experience, and theory and practice had to be redefined. As firm believers in experiment over understanding, Andreas Vesalius and Ambroise Paré were pioneers in leading the way towards this new science. If you enjoyed this episode, I’d greatly appreciate it if you left a rating on iTunes, or any other app you use for listening to me. For more information on the medical revolution that almost happened, check out David Wootton’s Bad Medicine, a rather provocative book that served as the main source for this episode. You’ll find a link to it on the website: ahistoryof.science. Thanks for listening. Hopefully until another History of Science. Science is never the work of any one individual. Its history is not a steady progression of successful discoveries. Its story involves as much perspiration as it does inspiration, counting a dozen failures for each success. What drove pioneering scientists? Did they seek wisdom or wealth? Did they want to reveal nature or reform it? Were their insights brilliant or bizarre? And did they shape their world more than it shaped them? In A History of Science, I explore the cultures, communities, and contexts in which these people gained their remarkable insights. This podcast is produced infrequently by me, Dr Michiel Meulendijk. I am an information scientist and a history buff. All that remains of the past is information; whether it be ruins, fossils, or manuscripts. History is the narrative we build interpreting that information. All content (c) 2017-2018 Michiel Meulendijk. Please contact me before reusing anything.